Like Miss Marple, Jessica Fletcher Jane Tennison (sexier)… I’m taking on a cryptic challenge to uncover the secret behind The BIG Skincare Mystery. Unlike my Prime Suspect role model, they’ll be no dead bodies (only dead skin), and hopefully no issues with institutionalised sexism. A suspect package containing an unbranded, unmarked bottle of lotion dropped through my letter box* yesterday morning with the curious label you see above attached. I shall call it… Exhibit A. A milky, pale green hue with a creamy formula that smells fresh and a little bit like cucumber(?). Curiouser and curiouser! All I know about it (thanks to a purposefully vague press release) is that it’s a new multi-purpose daily cleanser which promises to tackle common skin issues like oiliness without leaving skin feeling tight or dehydrated. Well, it’s picked a tough tester here because my skin tightens at the mere sight of anything targeted toward oilier skins thanks to my typical combination/unbalanced skin type. In my non-expert opinion, the ingredients suggest that it’s something we’ll find on the high street *strokes chin thoughtfully* and I see clay and salicylic acid to help degunk those pores. I’m told that it’s multi-use and as well as a daily face wash, it can be employed as a face mask up to 3x weekly, leaving on for up to three minutes before rinsing clear. Dermatologist Susan Mayou from the Cadogan Clinic, London says: “When it comes to facial cleansing, many products, especialy thouse designed for problem skin, can cause drying if used every day. The impressive thing about this mystery new range is that each product has been specially balanced with ingredients that clear blemishes effectively but are also gentle enough to be used as part of an everyday cleansing regime”. If you want to join in with the fun, head over to the facebook page for The Big Skincare Mystery and request a mystery sample to try for yourself – by doing so, you also stand the chance at winning your share of £1000 in Topshop vouchers. 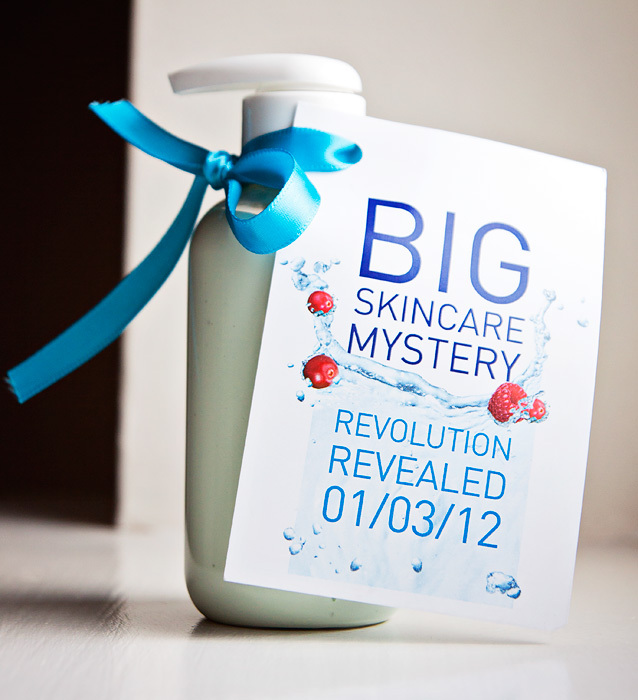 The BIG reveal will take place on March 1st 2012. The game is afoot! Sounds like that Garnier Pure 3 in 1 wash/scrub/mask to me. Hope it’s good, I’ve been thinking about trying that one for a while now! How intriguing! I’ve signed up for a sample… will be very interesting to see what it is! Sorry if this appears twice, IE froze up. Irrespective of the product and how well it performs this is a masterstroke in PR terms, someone, somewhere deserves a very big bonus, I love it! It’s being run by Reckitt Benckiser Healthcare who make E45 and Clearasil. Interesting PR campaign, I’ve requested a sample via their FB page! love the simple packaging as it is, the colours, the ribbon everything. What fun! I hope they do something like this in Australia! I love a bit of mystery. Ooooooh, thanks for the heads-up. I’ve requested a sample. Love mystery trials. I think I know what it is. I think it might be a clearasil product I tested for glamour a while back. I have requested a sample because I want to see if I am right or not without having to wait until March as I am an incredibly impatient person. I wish I could request a sample but I’m in New Zealand at the moment and they seem to have blocked the facebook page link for viewers outside of the UK. My guess is Clearasil something or other and I’d be likely to try it based on a couple of blog posts I’ve read about it. The first being the one on Makeup Savvy. Please do mention when you find out what brand it is. I don’t suppose you want to tell me who the PR agency is handling this? I’d love to write and ask for a sample to try it myself. I’ll be back in the UK in early March.